DIE Jovis, 24 die Januarii. Memorandum, concerning Lords of the Privy Council not being named. Heads for a Conference, concerning it. Message to H. C. for this Conference. Message from thence, with a Bill;-and to return Mildmay's. Hodie 2a vice lecta est Billa, "An Act for selling a Messuage in Cheswicke, for Payment of the Debts of Edward Russell Esquire." The Earl of Dorsett reported, "That the Committee have considered the Bill concerning the Lady of Abergaveny; and their Lordships have thought fit to make some Alterations and Amendments therein, which are offered to the Consideration of this House." The said Amendments and Alterations were read Twice, and Agreed to; and the House ordered the Bill to be engrossed, with these Alterations and Amendments. The Lord Newport reported, "That the Committee have considered the Bill for Redress of Inconveniencies by Want of Proof of the Decease of Persons beyond the Seas, or absenting themselves, upon whose Lives Estates do depend; and the Committee have made some Alterations and Amendments therein, which were offered to their Lordships Consideration." And the Amendments and Alterations being read Twice, were Agreed to; and the Bill ordered to be engrossed, with those Amendments and Alterations. 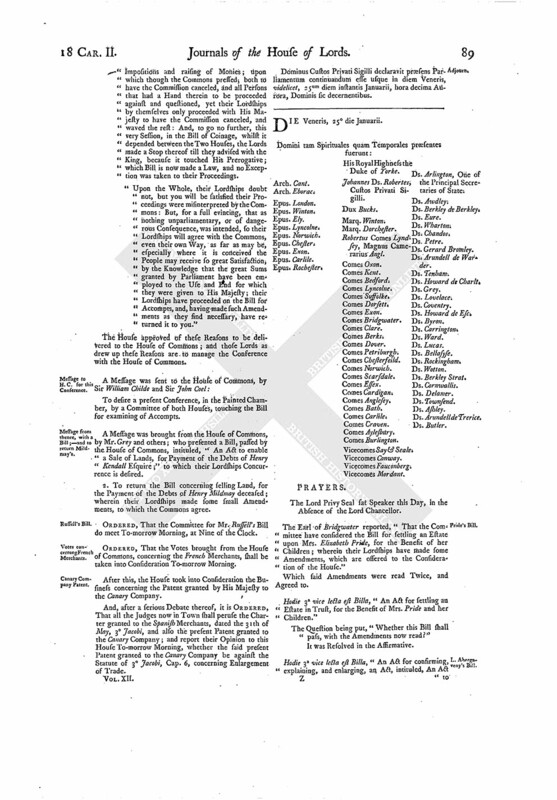 Next, the House was adjourned into a Committee, to consider of the Bill for examining Accompts. The Earl of Bridgwater reported, "That the Committee of the whole House have considered of the Bill for examining of Accompts; wherein the Committee have made several Alterations and Amendments, which are offered to the Consideration of the whole House." The said Alterations were read Twice. Seth Lord Bishop of Exon. William Lord Grey de Wark. Edw. Lord Howard de Esc. Richard Lord Arundell de Treric. Memorandum, That the Reason why none of the Lords of His Majesty's Privy Council, Members of this House, were now named to be Commissioners, was, because it was the Desire of the Lords of the Council themselves to the House, that they might be left out at this Time. Then the House agreed to the Report; and ORDERED, The said Alterations and Amendments shall be delivered to the House of Commons, at a Conference. Hodie 3a vice lecta est Billa, "An Act for examining the Accompts of divers Sums of Monies." The Question being put, "Whether this Bill, with the Alterations and Amendments now read, shall pass?" After this, the Earl of Anglesey reported, "That the Committee have considered of some Reasons to be offered to the House of Commons, in Answer to their Reasons delivered at a late Conference, concerning the examining of Accompts of Public Monies." 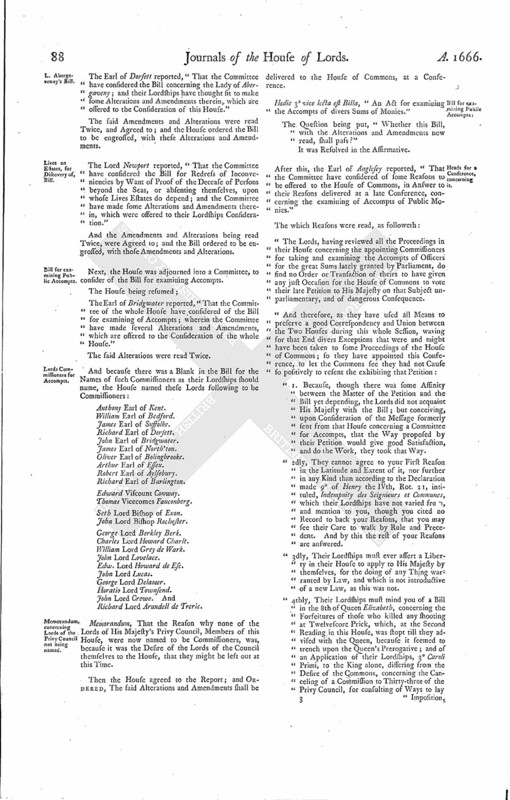 "The Lords, having reviewed all the Proceedings in their House concerning the appointing Commissioners for taking and examining the Accompts of Officers for the great Sums lately granted by Parliament, do find no Order or Transaction of theirs to have given any just Occasion for the House of Commons to vote their late Petition to His Majesty on that Subject unparliamentary, and of dangerous Consequence. "1. Because, though there was some Affinity between the Matter of the Petition and the Bill yet depending, the Lords did not acquaint His Majesty with the Bill; but conceiving, upon Consideration of the Message formerly sent from that House concerning a Committee for Accompts, that the Way proposed by their Petition would give good Satisfaction, and do the Work, they took that Way. "2dly, They cannot agree to your First Reason in the Latitude and Extent of it, nor further in any Kind than according to the Declaration made 9° of Henry the IVth, Rot. 21, intituled, Indempnity des Seignieurs et Communes, which their Lordships have not varied from, and mention to you, though you cited no Record to back your Reasons, that you may see their Care to walk by Rule and Precedent. And by this the rest of your Reasons are answered. "3dly, Their Lordships must ever assert a Liberty in their House to apply to His Majesty by themselves, for the doing of any Thing warranted by Law, and which is not introductive of a new Law, as this was not. "4thly, Their Lordships must mind you of a Bill in the 8th of Queen Elizabeth, concerning the Forfeitures of those who killed any shooting at Twelvescore Prick, which, at the Second Reading in this House, was stopt till they advised with the Queen, because it seemed to trench upon the Queen's Prerogative; and of an Application of their Lordships, 3° Caroli Primi, to the King alone, differing from the Desire of the Commons, concerning the Canceling of a Commission to Thirty-three of the Privy Council, for consulting of Ways to lay Impositions and raising of Monies; upon which though the Commons pressed; both to have the Commission canceled, and all Persons that had a Hand therein to be proceeded against and questioned, yet their Lordships by themselves only proceeded with His Majesty to have the Commission canceled, and waved the rest: And, to go no further, this very Session, in the Bill of Coinage, whilst it depended between the Two Houses, the Lords made a Stop thereof till they advised with the King, because it touched His Prerogative; which Bill is now made a Law, and no Exception was taken to their Proceedings. "Upon the Whole, their Lordships doubt not, but you will be satisfied their Proceedings were misinterpreted by the Commons: But, for a full evincing, that as nothing unparliamentary, or of dangerous Consequence, was intended, so their Lordships will agree with the Commons, even their own Way, as far as may be, especially where it is conceived the People may receive so great Satisfaction, by the Knowledge that the great Sums granted by Parliament have been employed to the Use and End for which they were given to His Majesty; their Lordships have proceeded on the Bill for Accompts, and, having made such Amendments as they find necessary, have returned it to you." The House approved of these Reasons to be delivered to the House of Commons; and those Lords as drew up these Reasons are to manage the Conference with the House of Commons. To desire a present Conference, in the Painted Chamber, by a Committee of both Houses, touching the Bill for examining of Accompts. A Message was brought from the House of Commons, by Mr. Grey and others; who presented a Bill, passed by the House of Commons, intituled, "An Act to enable a Sale of Lands, for Payment of the Debts of Henry Kendall Esquire;" to which their Lordships Concurrence is desired. 2. 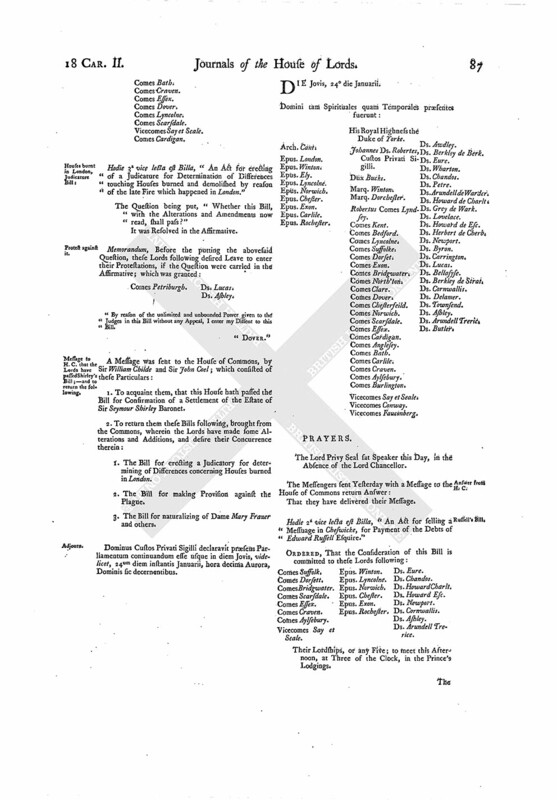 To return the Bill concerning selling Land, for the Payment of the Debts of Henry Mildmay deceased; wherein their Lordships made some small Amendments, to which the Commons agree. ORDERED, That the Committee for Mr. Russell's Bill do meet To-morrow Morning, at Nine of the Clock. ORDERED, That the Votes brought from the House of Commons, concerning the French Merchants, shall be taken into Consideration To-morrow Morning. After this, the House took into Consideration the Business concerning the Patent granted by His Majesty to the Canary Company. And, after a serious Debate thereof, it is ORDERED, That all the Judges now in Town shall peruse the Charter granted to the Spanish Merchants, dated the 31th of May, 3° Jacobi, and also the present Patent granted to the Canary Company; and report their Opinion to this House To-morrow Morning, whether the said present Patent granted to the Canary Company be against the Statute of 3° Jacobi, Cap. 6, concerning Enlargement of Trade. Dominus Custos Privati Sigilli declaravit præsens Parliamentum continuandum esse usque in diem Veneris, videlicet, 25um diem instantis Januarii, hora decima Aurora, Dominis sic decernentibus.